Download "Management School. MSc/PG Dip/PG Cert. International Accounting & Finance. 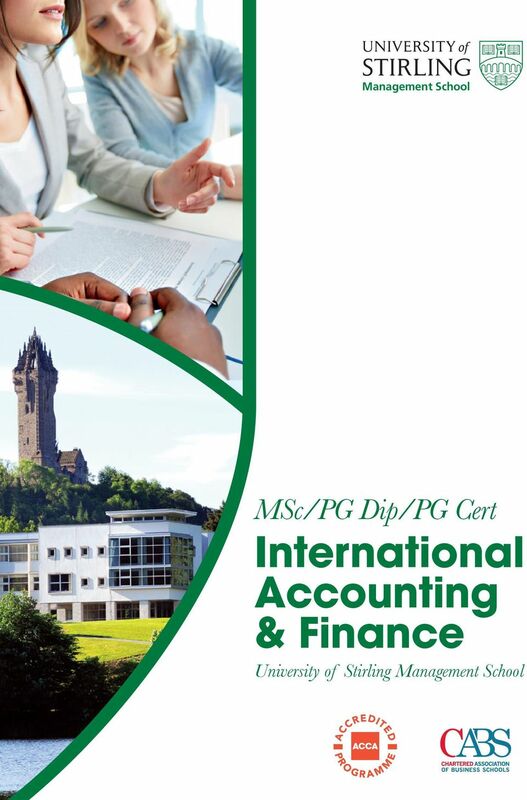 University of Stirling Management School"
2 Globalisation, growth of multinational enterprises, convergence of international accounting practices and the expansion of the European Union all contribute to the importance of an international focus in accounting and finance education. The increasing influence of international financial reporting standards and the shortage in some countries of international accounting expertise have led to significant demand for relevant education. This course provides rigorous training for those seeking a career working in international finance or within a multinational corporation as well as for those wishing to pursue higher studies, such as a PhD. Professor David McMillan, Course Director The ACCA-accredited MSc International Accounting & Finance reflects these developments. It provides a solid foundation for students seeking a qualification as a Certified Accountant of international standing or for those students looking to understand recent developments and key trends in international finance. 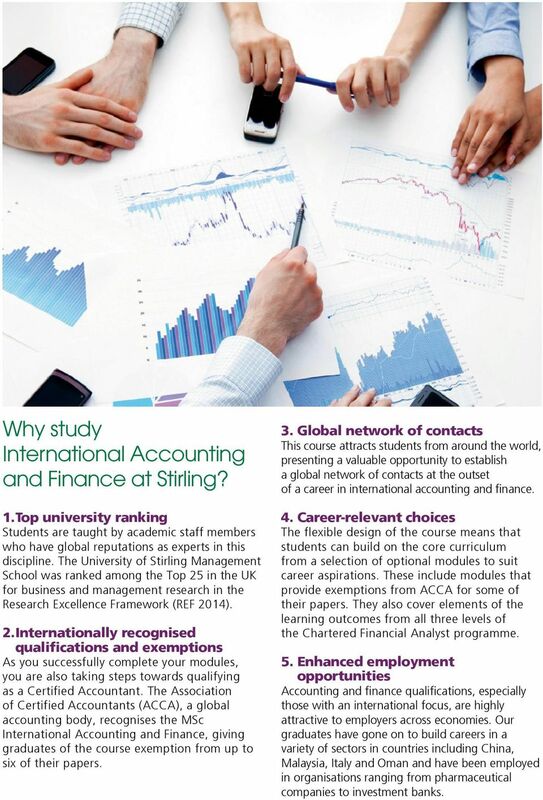 3 Why study International Accounting and Finance at Stirling? 1. Top university ranking Students are taught by academic staff members who have global reputations as experts in this discipline. The University of Stirling Management School was ranked among the Top 25 in the UK for business and management research in the Research Excellence Framework (REF 2014). 2. Internationally recognised qualifications and exemptions As you successfully complete your modules, you are also taking steps towards qualifying as a Certified Accountant. The Association of Certified Accountants (ACCA), a global accounting body, recognises the MSc International Accounting and Finance, giving graduates of the course exemption from up to six of their papers. 3. Global network of contacts This course attracts students from around the world, presenting a valuable opportunity to establish a global network of contacts at the outset of a career in international accounting and finance. 4. Career-relevant choices The flexible design of the course means that students can build on the core curriculum from a selection of optional modules to suit career aspirations. These include modules that provide exemptions from ACCA for some of their papers. They also cover elements of the learning outcomes from all three levels of the Chartered Financial Analyst programme. 5. Enhanced employment opportunities Accounting and finance qualifications, especially those with an international focus, are highly attractive to employers across economies. Our graduates have gone on to build careers in a variety of sectors in countries including China, Malaysia, Italy and Oman and have been employed in organisations ranging from pharmaceutical companies to investment banks. 4 What is International Accounting and Finance? 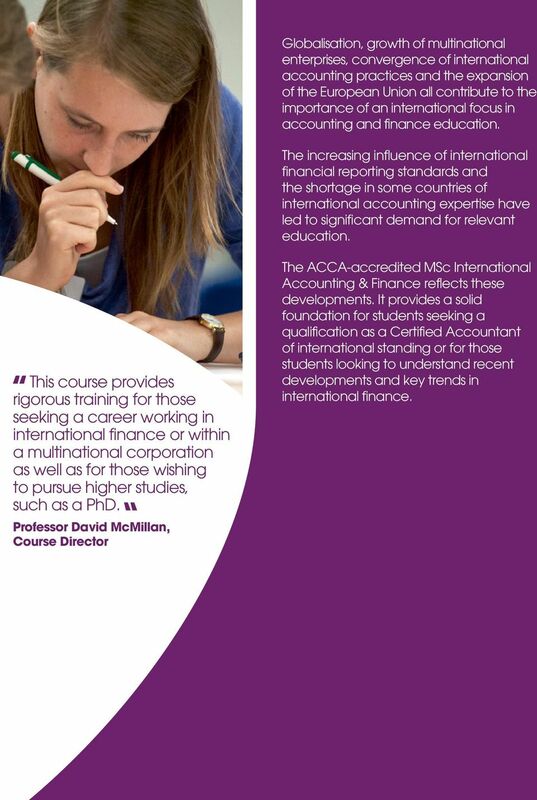 International accounting and finance provides specialised training in international accounting, developing the reporting and analysis skills required by global organisations. It also enables students to establish an appreciation of issues relating to international investments from a range of perspectives. This course allowed me to enter a totally different world, learning how money circulates, and about financial markets, and the mechanisms for investing, saving, and earning. Within months, from minimal understanding of such matters, I developed an essential grounding in accounting procedures, and financial reporting which gave me insight into professional practices. Boram Lee, MSc International Accounting and Finance Course content For further information on the course content visit: At Stirling, there is a strong focus on developing a deep understanding of international accounting standards as well as corporate governance and social and environmental accounting. This takes place as students are equipped with an appreciation of international financial markets. Developing real-world expertise As part of the Management School s focus on enhancing graduate employability we offer an intensive trading Boot Camp for Master s students on our finance-related courses. 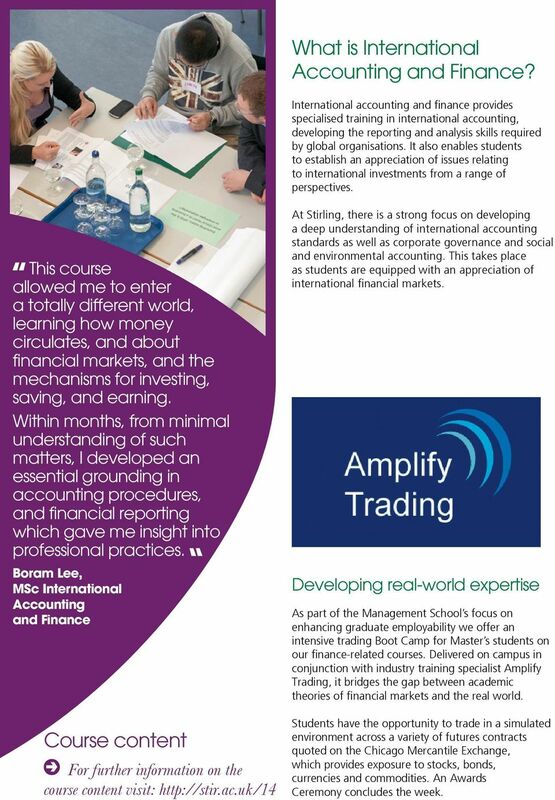 Delivered on campus in conjunction with industry training specialist Amplify Trading, it bridges the gap between academic theories of financial markets and the real world. Students have the opportunity to trade in a simulated environment across a variety of futures contracts quoted on the Chicago Mercantile Exchange, which provides exposure to stocks, bonds, currencies and commodities. An Awards Ceremony concludes the week. 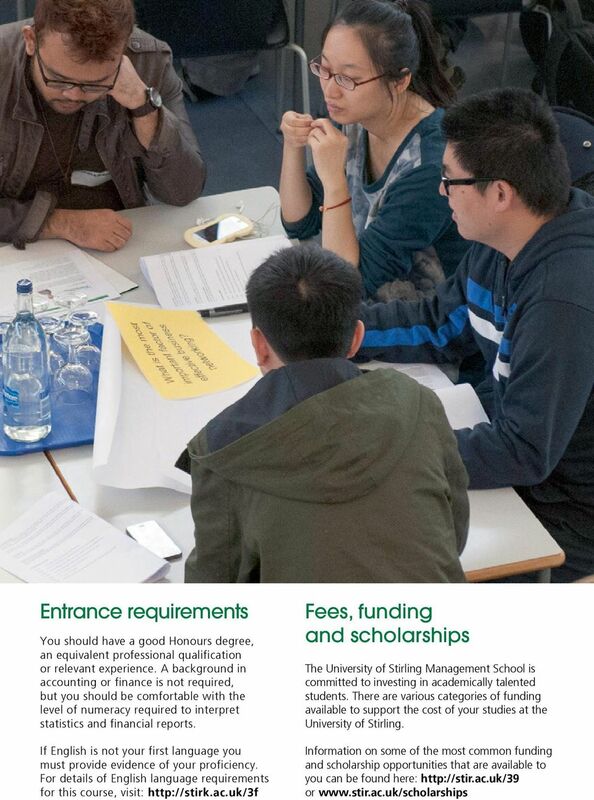 5 About the course The MSc International Accounting and Finance is a one-year, full-time course of two 15-week semesters followed by a supervised dissertation. Teaching includes lectures, seminars, workshops and practical case study exercises. A Postgraduate Diploma follows exam success at the end of the second semester. The Master s degree is awarded after you have satisfactorily completed the dissertation. 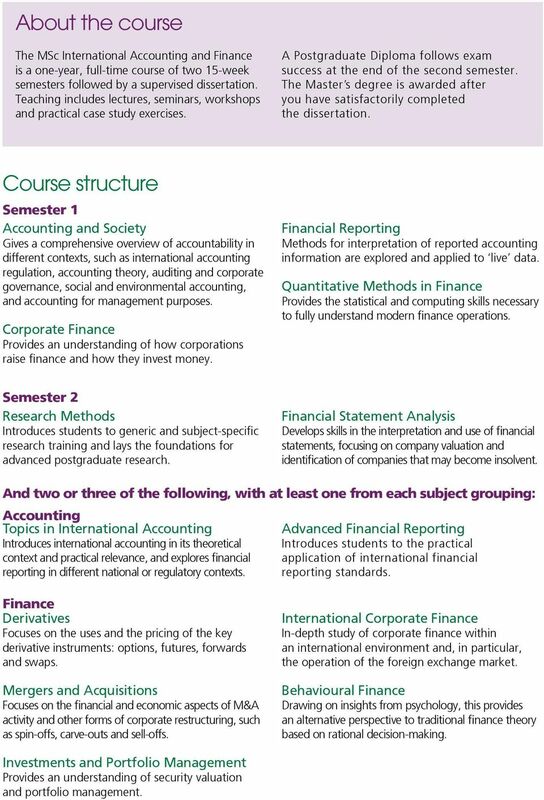 Course structure Semester 1 Accounting and Society Gives a comprehensive overview of accountability in different contexts, such as international accounting regulation, accounting theory, auditing and corporate governance, social and environmental accounting, and accounting for management purposes. Corporate Finance Provides an understanding of how corporations raise finance and how they invest money. Financial Reporting Methods for interpretation of reported accounting information are explored and applied to live data. Quantitative Methods in Finance Provides the statistical and computing skills necessary to fully understand modern finance operations. Semester 2 Research Methods Introduces students to generic and subject-specific research training and lays the foundations for advanced postgraduate research. Financial Statement Analysis Develops skills in the interpretation and use of financial statements, focusing on company valuation and identification of companies that may become insolvent. And two or three of the following, with at least one from each subject grouping: Accounting Topics in International Accounting Introduces international accounting in its theoretical context and practical relevance, and explores financial reporting in different national or regulatory contexts. Advanced Financial Reporting Introduces students to the practical application of international financial reporting standards. Finance Derivatives Focuses on the uses and the pricing of the key derivative instruments: options, futures, forwards and swaps. Mergers and Acquisitions Focuses on the financial and economic aspects of M&A activity and other forms of corporate restructuring, such as spin-offs, carve-outs and sell-offs. International Corporate Finance In-depth study of corporate finance within an international environment and, in particular, the operation of the foreign exchange market. Behavioural Finance Drawing on insights from psychology, this provides an alternative perspective to traditional finance theory based on rational decision-making. Investments and Portfolio Management Provides an understanding of security valuation and portfolio management. 6 There is an exponential learning curve during the Amplify Trading Boot Camp. You get to execute your decisions right there, right then. The live prices, with which you trade, change every second, and you make gains and losses all the time. 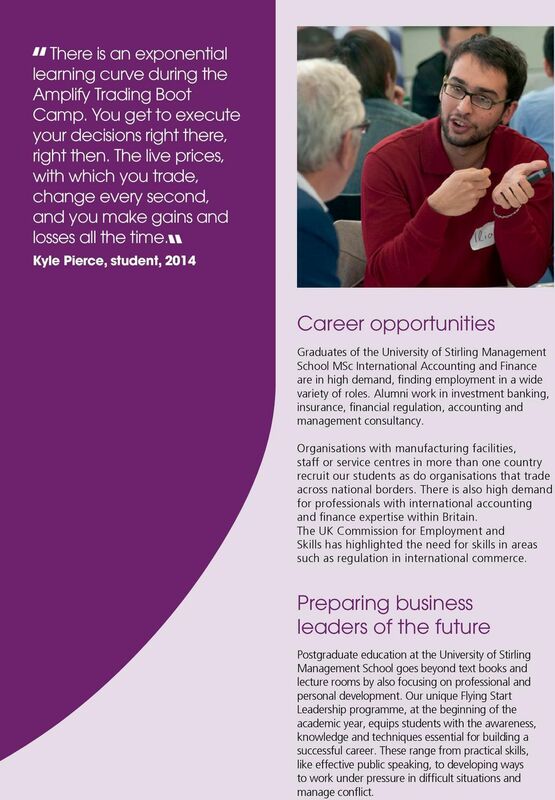 Kyle Pierce, student, 2014 Career opportunities Graduates of the University of Stirling Management School MSc International Accounting and Finance are in high demand, finding employment in a wide variety of roles. Alumni work in investment banking, insurance, financial regulation, accounting and management consultancy. Organisations with manufacturing facilities, staff or service centres in more than one country recruit our students as do organisations that trade across national borders. There is also high demand for professionals with international accounting and finance expertise within Britain. The UK Commission for Employment and Skills has highlighted the need for skills in areas such as regulation in international commerce. 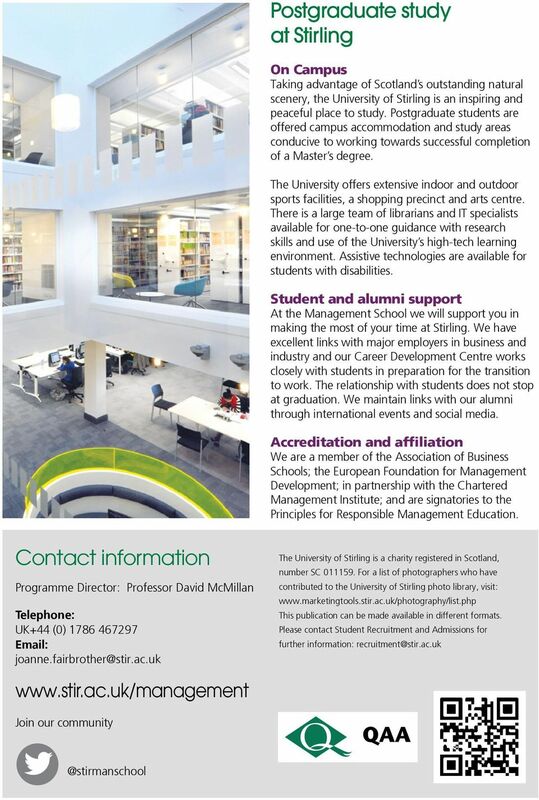 Preparing business leaders of the future Postgraduate education at the University of Stirling Management School goes beyond text books and lecture rooms by also focusing on professional and personal development. Our unique Flying Start Leadership programme, at the beginning of the academic year, equips students with the awareness, knowledge and techniques essential for building a successful career. These range from practical skills, like effective public speaking, to developing ways to work under pressure in difficult situations and manage conflict. An Coláiste Ollscoile Baile Átha Cliath National University of Ireland, Dublin Ollscoil na héireann, Baile Átha Cliath Planning and Environmental Policy Session 2005/06 Contents Introduction:...Error! BUSINESS SCHOOL Master of Commerce A WORLD CLASS BUSINESS EDUCATION Advance your career A Master of Commerce from the internationally accredited can boost your employment opportunities around the world.